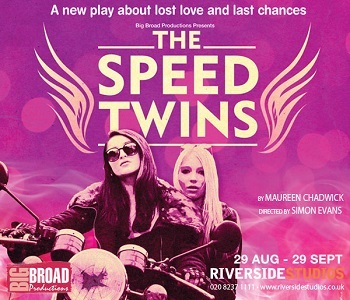 The Speed Twins is a new play by Maureen Chadwick, writer of Bad Girls, Footballers' Wives and Waterloo Road. Being a big BG fan back in the early noughties, I couldn't help but have some expectations: hard hitting themes explored through gritty characters, with just enough camp comedy to entertain yet still be on the right side of plausible. The problem with expectations, of course, is that they become a yardstick to evaluate an experience, rather than engaging with it for what it is. So in this sense, I wish I hadn't known who the writer was before I entered the (under)world of Queenie - the ageing home counties prom queen who comes face to face with her past - and herself - with a little help from no-nonsense, big-hearted Ollie. The character of Ollie is played wonderfully by Amanda Boxer, who for me, is the real star of the show. Despite being the most archetypal lesbian character in the play, she is the most three dimensional. Her perfectly pitched one-liners and deft undertones of sadness create real pathos, making her both funny and touching to watch. The main storyline between Queenie and her lost love, Shirley, is intriguing, but the rushed pace of the first half doesn't allow for this and Queenie's internal struggles to be explored in enough depth, or to feel like a natural playing out of events and realisations. I appreciate that you can only layer storylines so much in a stage play, and this is where my comparisons to Maureen Chadwick's TV work weren't helpful! But it also feels as though there is too much sign-posting of familiar themes. If the audience were left to work out or interpret more for themselves, then I think this would be a more affecting exploration of internalised homophobia, identity, love and regret. The Speed Twins is playing at Riverside Studios, Hammersmith, until 28 September.